Common to municipalities around the world is the need to maintain a clean and sanitary environment suitable for humans to live and work. This responsibility includes providing a system for efficiently moving both wastewater and stormwater, along with solid materials, through a collections system from the source to an environmentally safe place of treatment and disposal. A wastewater collections system is typically a network of pipes, manholes, clean-outs, traps, siphons, lift stations and other required structures to collect all the wastewater from an area and transport it to a treatment plant or disposal system. Some systems are “combined systems” that are designed to collect both sanitary wastewater and storm or surface water runoff. Sewer systems can be located above or underground, typically running parallel to streets, housing, commercial and residential structures. This series of pipes and culverts are engineered as gravity flow systems, built on a slight grade to assist material flow. Most sewers are designed to convey material at a velocity of 2 feet per second. When velocity falls below this rate solids will settle out of the flow to the bottom of the pipe, reduce flow capacity, and may eventually cause a stoppage. If the sewer is designed for flow greater than 10 feet per second, solids could separate from the flow during low usage. At high velocities splashing occurs when the water changes directions, releasing odors and accelerating the corrosion of concrete structures. The systems are engineered with inadequate flow capabilities for the area served, or the community experiences unexpected population growth. The collections systems were not installed as designed, resulting in faulty construction, poor inspection or low-bid short cuts. The joint seals have become damaged due to earth movements, vibration from traffic, settling or construction disturbance. Pipe joints have been damaged by plant and tree root growth. Partial or complete interruption of the flow may result from an obstruction in a sewer. When a stoppage occurs, material will back up and eventually overflow the system up to the point of the blockage. Streets, homes and businesses can be damaged from the debris. Human health is threatened with unsanitary conditions and the spread of germs and disease. Stormwater run-off often carries gravel, sand, leaves and other street debris. This material often runs down the system after it has rained, creating buildup within the storm sewer system. When the rainwater can no longer flow down a system because pipes and culverts are blocked, streets will become flooded, which creates hazardous or impassable travel conditions. Sewer systems around the world vary in many details. Type of material for the pipe, shape, size and location all differ. Regardless of these variables, sewer systems must be routinely cleaned to ensure safe, consistent movement of the material. Sewer cleaners combine high-pressure water jetting and a high-flow vacuum source to scour pipes clean and vacuum up the material causing blockages to restore and maintain normal sewer flow. Why use a combination sewer cleaner? It is safer to equip your crews with a combination sewer cleaning machine than to have to enter into the sewer system to remove blockages manually. The operator is safely removed from the health hazards of sewer work, as well as the occupational dangers associated with entering a confined space. Crews are less exposed to sewer methane gas emissions, and they will avoid encountering insects or small rodents that may occupy the sewer systems. 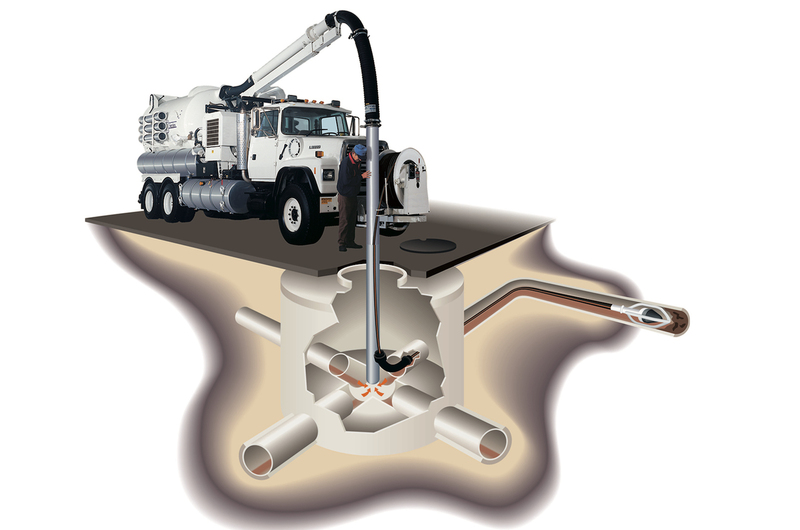 A sewer cleaner uses high-pressure water to break up the blockage, scour the pipe walls and flush the debris down the sewer system to the vacuum hose. This safely and efficiently removes the debris or blockage material from the sewer line. The vacuum system lifts the material into a debris body. The sewer cleaning machine safely contains the debris and water in the body, sealed with a neoprene gasket seal. The material remains contained in the debris body until the operator moves the truck to a safe dump site for treatment or disposal, at which time he releases the door locks and elevates the body. When dumping the operator stays well away from the rear, controlling the debris discharge safely from the curbside mounted controls. The debris body is washed out with a flush-out system. The operator can use the handgun hose to finish cleaning the debris body door seal. A combination sewer cleaner is more efficient than any other method of cleaning a sewer line, including manually removing obstructions or jetting a line. A combination machine will quickly clear the blockages, clean the entire pipe and remove the material that caused the blockage, contributing to longer life of the sewer system. A combination machine uses high-pressure water to scour the pipe and break through the blockage, flushing the debris back down the pipe to the vacuum hose. The vacuum hose removes the debris that is floating back down the pipe at a much faster rate than removing the material manually or by other means. Combination sewer cleaners can decant the excess liquid brought into the debris body back into the sewer line when cleaning is done. This decanting allows the operator to eliminate extra trips to the dump site during the day, keeping them on the job and working in an efficient manner instead of driving back and forth between the job site and the dump site. The decanting is done after the blockage is removed and the pipe is flowing freely. The excess water from the debris tank is poured back into the sewer line, allowing the sewer system to transport the water back to the sewage treatment plant. The solids and debris are retained in the debris body, reducing the weight and load of the combination unit. The operator simply has to fill up the aluminum tanks with water and proceed to the next job site. At the end of the day, the debris body should be full of mostly solids and debris, with very little excess water weigh being carried to the dump site. A combination sewer machine can carry 5 to 15 cubic yards of material, including liquids and solids, in the debris body. Mounted on a commercially available chassis, the operator can quickly transport the material to the treatment or disposal site and return to the work area to continue the cleaning process. A combination sewer cleaner carries more water in the water tanks than a trailer jetter. It also has the distinct advantage of removing the blockage material. For more information about sewer cleaning or to learn about the Vactor 2100i combination sewer cleaner and to schedule a demonstration, please visit www.vactor.com or see your local Vactor dealer.